The first time I attempted a gumbo, I really earned that dang soup. It’s not that it was a complicated dish to execute, but it had required more stamina than I ever expected. Any Louisianan would tell you the step requiring the most effort is making the roux, which involves whisking flour into hot oil until the mixtures turns dark brown. I didn’t realize you had to continuously whisk—no, listen to me: continuously whisk—for half an hour, if not more. My right forearm was dangling by a tendon by the time I achieved that coffee grounds color I desired. But good dang, was that chicken and andouille gumbo ever tasty. A few years back around Mardi Gras season, a colleague and I visited Big Jones, one of my favorite restaurants in Chicago and a proponent of “Heirloom Southern” cooking—that is, recreating dishes from historic Southern cookbooks (they also serve my second favorite fried chicken in the country, next to this place.) My friend was born and bred in Louisiana, and I wanted him to try Big Jones’ vaunted gumbo. 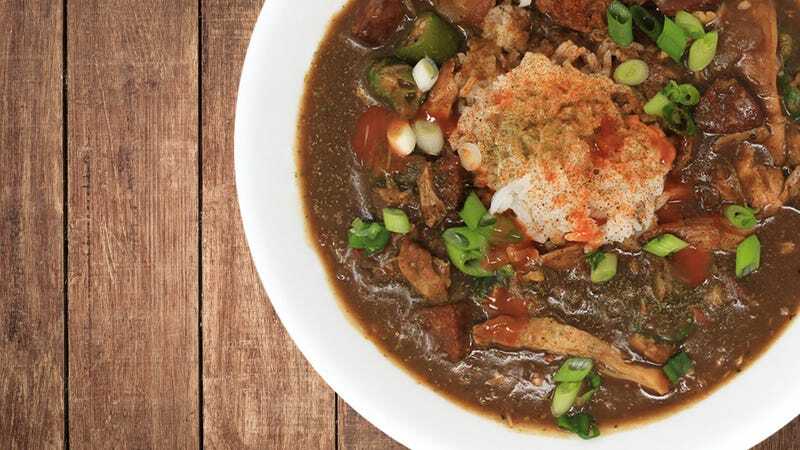 Unlike French Quarter versions, this gumbo featured a mahogany-hued roux—almost burnt-tasting, which was more in line with the game meat gumbos found in Cajun country. My Louisianan friend then let me in on a shocking secret: He told me he’d long abandoned the standing-over-a-stovetop-stirring-for-30-minutes method. His preferred technique, which required a fraction of the stirring and one-third the time: the microwave. Now, I could’ve swore I misheard. How could a red-blooded Louisiana boy dare commit such culinary heresy? But apparently this was a trade secret amongst gumbo lovers in the know, achieving a result just as faithful as the half-hour stovetop method. I finally tried this method over the weekend. He was right. The first thing you need is a quart Pyrex glass measuring cup, or any translucent bowl that’s microwave-safe. The next thing you need is to prepare your diced trinity (onions, green peppers, celery) ahead of time. Set about half of the diced vegetables aside for the microwave roux project, the other half you’ll sauté in the Dutch oven with the chicken and andouille. I add one cup of vegetable oil and one cup of all-purpose flour into the measuring cup, stirring together. Place in the microwave and cook at half power for five minutes. Please note: Every microwave is different, and you may not need the full five minutes. The reason you want to use a glass container is because the mixture will expand, and you do not want it to overflow (there’s a reason why they call roux “Cajun napalm”). If it looks like it’ll overflow, stop the microwave, carefully remove measuring cup with a hot towel and stir with a whisk or fork. If it doesn’t overflow, cook for the full five minutes, then remove and whisk. At this point, you’ll be microwaving the roux in 30 second intervals. Cook, remove cup with towel, whisk, return to microwave. You’ll do this anywhere from five to a dozen times. Here’s my mistake the first time I attempted this: I kept microwaving until the roux achieved that final color—that coffee grounds brown. What I didn’t realize was the flour will continue cooking, so it’ll keep turning darker as you let it sit. I’d take it out when it’s a shade lighter than KFC gravy and it starts thickening to a lightly chunky paste. Please be extra careful when removing from microwave and whisking—this stuff will give you third-degree burns, no joke. To help retard the cooking, take your diced trinity (remember, you’re using half for this roux and the other half for sautéeing) and slowly incorporate to the roux, one spoon at a time, to cool the roux. Your trinity will sizzle as if dropped it into a deep fryer, and the aroma will be intoxicating. And that’s it. You can now whisk this roux into your gumbo stock, or better yet, allow cool and freeze in ice cube trays. You’ll have gumbo starter at the ready.